Your purchase is complete. Thank you! We look forward to seeing you on October 1st. Join Louise Kay and Karen Neumann for an afternoon of wisdom and guidance shared in love! Louise Kay is originally from The UK and now travels the world sharing her gift of channeling and working as an Embodied Awareness facilitator. She channels a 9D Pleiadian Collective known as Aikon. Interacting with Aikon can be a life-changing experience. Aikon have extremely high-frequency, loving energy and share powerful, insightful, uplifting messages which have touched the hearts of many and have supported hundreds of people to overcome life-challenges and find inner peace. THEOS is a non physical collective of beings. They are beautiful teachers of humanity, teaching us about Unconditional Love and Oneness. They work with blueprints and codes, what we call sacred geometry and sound as welll. Many times when working with them you will hear the most beautiful cosmic melodies. At this event you will have the opportunity to interact directly with The Pleiadians and Theos and ask any questions that are dear to your heart. There are no limits so you can ask personal questions, questions connected to issues in society or related to the collective, explore issues connected to relationships and challenges in life, or simply sit and bask in the high frequency energies emanating from the energetic field. The afternoon will begin with a guided meditation followed by a channeling session with Louise and Aikon. 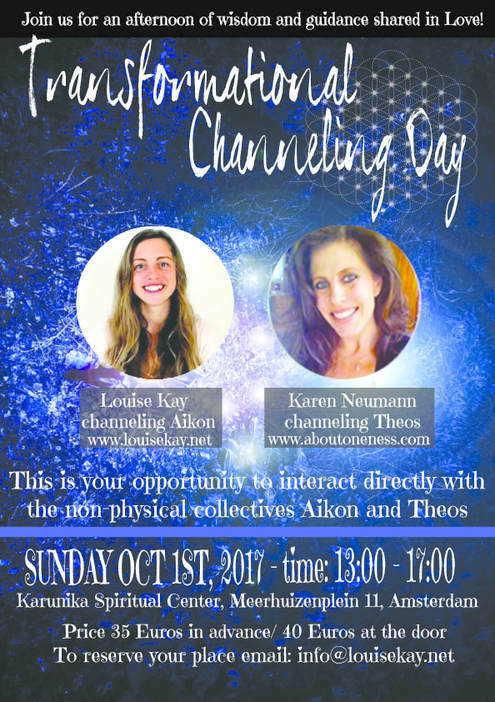 During a short break refreshments will be provided and the afternoon will continue with channeling by Karen and Theos. Afterwards there will be a Q and A discussion time and after the event participants are invited to join Louise and Karen for dinner at a nearby restaurant.